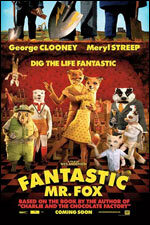 I’m intrigued by the critical reception to Wes Anderson’s adaptation of Roald Dahl’s children’s novel, Fantastic Mr. Fox. It currently sits at 92% on the Rotten Tomatoes scale, with 100% of the ‘Cream of the Crop’ critics reviewing it positively. It is by far the best-reviewed film of Anderson’s career. I don’t disagree with those critics — on the contrary, I love the film — but I wonder why it’s this film and not, say, Rushmore or The Royal Tenenbaums that has garnered such praise. Is it because of a built-in forgiveness toward quality animated films or children’s films that elevates any of them that are different and better than the norm?